In Maryland there is something of a drought occurring. It is well into the 90 degree range every day, and the earth is scorched a dusty brown. People walk around in a daze, with their tongues hanging down to the road like dogs…unless they have found an air conditioned escape. In upstate New York – it is monsoon season. Temperatures are in the 70 degree comfort zone…and it’s raining. Rain is not part of my plan. 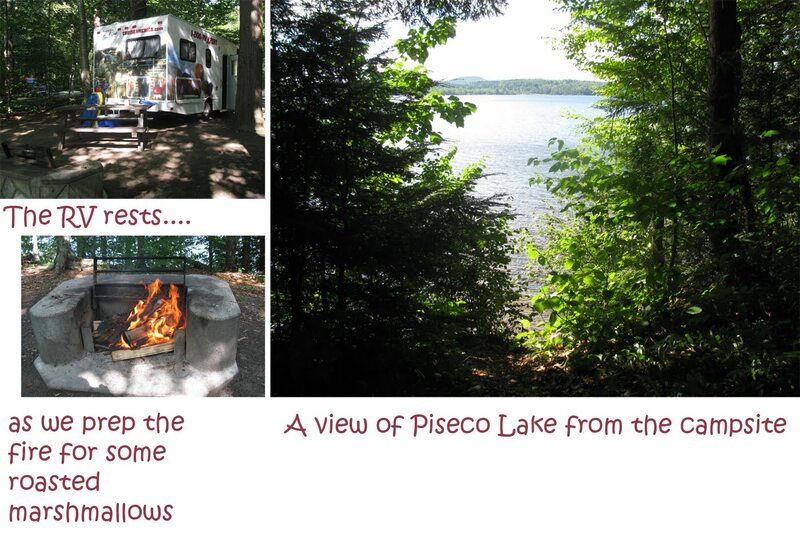 Of course we are nice and dry in our big RV box – but I am getting worried about getting rained out of a day of open water swim on Piseco Lake. You see, Saturday (tomorrow) is the Piseco Lake Triathlon. Convenient how this triathlon just HAPPENS to occur during the time we are in a camper-DOO just a few miles down the road. But I need to swim in the lake. Swimming in open water is not one of my strong suits – so a little practice swim would be helpful. By 5PM, the rains have ceased – and we whip into swim gear. For Paddy, swim gear includes a boogie board and diver fins. He will be swimming by my side, as I attempt to swim otherwise unaided from our campside (23A) to the official campsite beach – ¼ mile away. There is a bit of a breeze, and the duo Paddy-Janie team heads out into deep water, parallel to the shoreline. I like swimming with the wind and waves, and waste no time making it to our destination. Paddy fins along on the boogie board no less than 10 feet away. I actually have enough energy to carry on a conversation. Something like – “Paddy – you are too far away – get closer”. Irregardless that the conversation revolves around swim proximity – things have certainly changed from 2 years back – where I would not have had any air in my lungs for chatter. We turn to head back, and the practice swim becomes more of a struggle. The wind and waves makes it much harder to swim in the opposite direction, and eventually I grab on to the boogie board and let Paddy guide us back. I sure hope it is not windy tomorrow for the triathlon.